100,000 hits in 40 months! That is how long this blog has been in existence and that works out at about 2,500 hits a month. I’m pleased and thank you very much! I feel I should reward you in some way – that is if you can call what I am going to suggest as a ‘reward’and not a blight or a blot on the landscape. 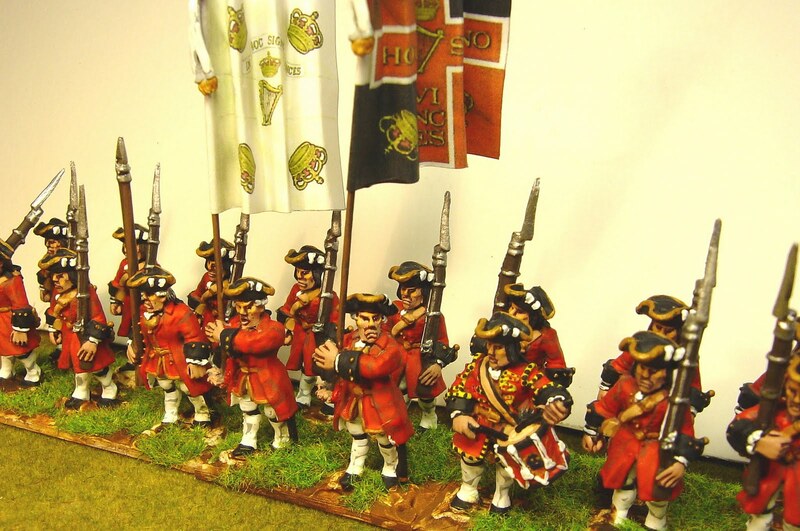 I’d like to paint up a unit of wargames figures for free to the first two readers who drop me an email. A unit of 15/18mm or 25/28mm infantry or cavalry – you supply and post the figures to me, I’ll paint them and post them back to you for free. My painting schedule is quite heavy but I promise I will paint them this year! I will be happy to discuss the project but reserve the right to paint only those periods that appeal to me and to paint only figures that I like. On another subject, I will be selling most of my SYW French/Allied figures quite soon on eBay. I’ll be starting off this coming week with the French and when they have been sold I’ll move on to the much larger Allied/Pragmatic army. I’ve learned a lesson about myself with this project as it was always too ambitious for me having to paint both sides and I’d rather concentrate on smaller armies. 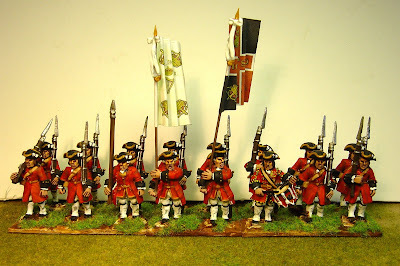 In all honesty I’ve become a little bored with them and I have the glint of Napoleonics (my first wargaming interest) in my eyes. I’m sure I will return to the SYW at some time in the future. I’ll post next week with the eBay auction numbers. Meanwhile here are two more battalions of Irish – Dillon and Rooth. Dillon has black facings and Rooth has blue. The figures are by Foundry and that completes a full Irish brigade of four battalions. These are, by the way, the figures that lean to the left when you buy them. To cure this problem I’ve inserted a small wedge of cardboard underneath almost every figure to bring them to a more visually appealing vertical. These will be in the coming auction. The 'competition' is now over as I will be painting units for Seb and James so sorry folks! 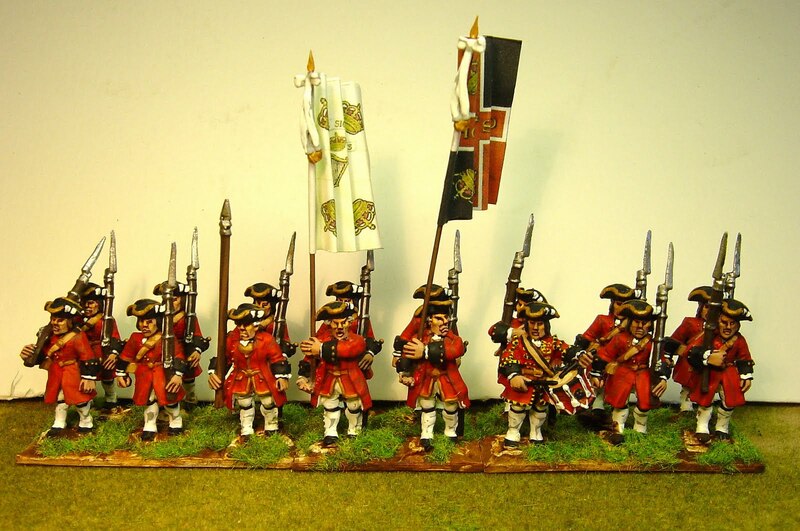 I'm probably too late but I've got some 15mm SYW Austrians or Prussians I'd like help with. I cannot find your email anywhere. BTW- I believe the drummers of Roth's Regt actually had mixed yellow/blue lace exactly like that worn by musicians of British Royal regts. Roth's was descended from the footguard unit of James II's exile army- hence also the blue facings and very British flag- originally to emphasise the 'legitimate Stuart line' argument. 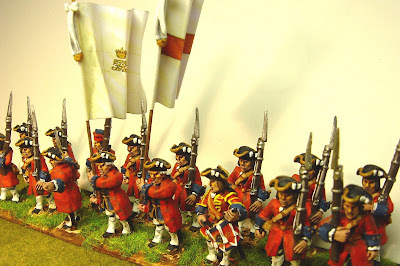 Re your sale plans- I'm not a 28mm gamer but I'm sure it will make many who are very happy! Sad... I would have like to play a SYW game with you ! And i won't be able to buy it... But i have only a few SYW figures on my side. And mostly unpainted ! These are rather for a skirmish game. 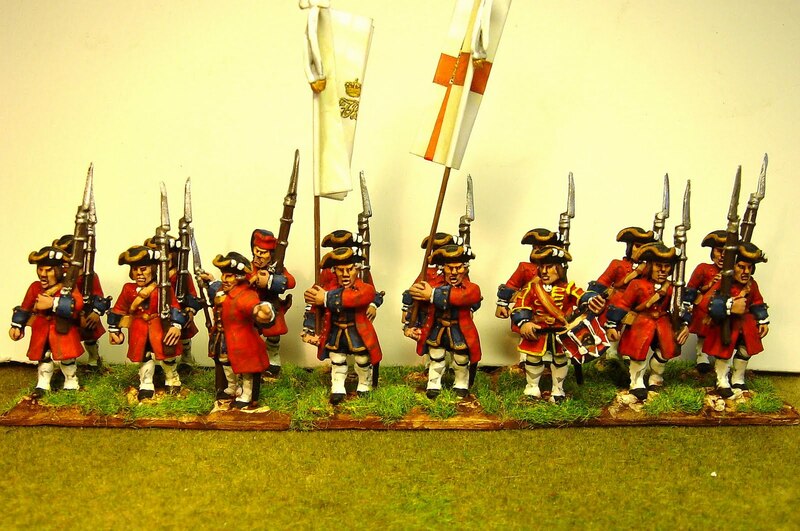 If you agree to paint them (some french dragoons and dismount Luckcner hussars - 2 WF packs in all, it would be great ! Les régiments de Dillon et de Rothe appartenaient à mes ancêtres Arthur Dillon et Michel de Rothe. Je ne sais pas si je pourrai enchérir sur les deux régiments mais votre travail est magnifique.